It’s an epic tale of adventure involving merchant sailors shipwrecked on an island that’s home to shape-shifting ogresses. It’s also part of a storytelling tradition of major significance to Buddhist scholars as well as to the Nepali and Tibetan communities. A prominent Buddhist scholar will conduct a retelling of the Avadāna of the Merchant Simhala at the Royal Ontario Museum (ROM) in Toronto on Sunday, Aug. 27. It’s an event being organized by Associate Professor Jason Neelis of Wilfrid Laurier University’s Department of Religion and Culture, in collaboration with the University of Toronto’s Ho Centre for Buddhist Studies, to kick off a mini-conference on the past lives of the Buddha. The storytelling will be performed in English by Professor Naresh Man Bajracharya, vice-chancellor of Lumbini Buddhist University in Nepal. Accompanying the story will be a reproduction of a nine-metre (30-foot) painted scroll from the Kathmandu Valley that illustrates the tale. Parts of the scroll will also be digitally projected onto screens. The event will take place at the Eaton Theatre Auditorium of the ROM, from 10 a.m. to noon. It should be of interest to a wide audience ranging from children eager to hear an exciting tale of magic and heroism to Buddhist scholars, says Neelis. The version of the tale being told is from the Newar people of Nepal. Doors open at 9:30 a.m. and the event is free but does not include ROM admission. Attendees wishing to visit the ROM after the event must buy tickets. No pre-registration is necessary and seating is on a first-come, first-served basis. Bajracharya will be introduced by Associate Professor Christoph Emmrich of the University of Toronto and Deepali Dewan, the ROM’s curator of South Asian art and culture. Honorary Consul General of Nepal Kunjar Sharma will also speak briefly. Professor Todd Lewis of College of the Holy Cross (Massachusetts) will speak after the storytelling to put it in context. 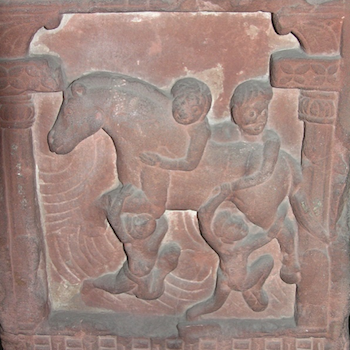 In the story, the hero, Simhala-Sarthavahu, is rescued from the island by a horse that is a bodhisattva, destined to be reborn as the Indian prince who came to be known as the Buddha. Exploring narratives of “Where the Buddha was Previously Born, Seen, and Heard” is the topic of the mini-conference, which will be attended largely by members of the International Association of Buddhist Studies (IABS) following that organization’s XVIIIth Congress at the University of Toronto. The conference will bring together leading international Buddhist studies scholars and graduate students who will contribute to interdisciplinary academic panels on the transmission and transformation of Buddhist rebirth narratives in texts and art across Asia. It will also feature a roundtable discussion of the results of a two-year collaborative research project in which art historians and textual specialists have been working on collecting and cataloguing artistic representations and summaries of previous-birth narratives in early Buddhist manuscripts from ancient Gandhāra, situated in what is now Pakistan and Afghanistan. The conference and storytelling event are supported by grants from the Robert H. N. Ho Family Foundation for Buddhist Studies and from the Social Sciences and Humanities Research Council of Canada (SSHRC). For more information, see simhala-sarthavaha.org or contact Jason Neelis.